Deep brain stimulation (DBS) is a treatment for symptoms of Parkinson's disease, including tremors, stiffness, and trouble walking. It can also treat side effects of Parkinson's medicines. DBS isn't a cure for Parkinson's and won't stop it from getting worse. But it may be an option if you've had the disease at least 5 years and don't get enough relief from medicine. For some people, DBS is life-changing. For others, the results aren't as good. If it doesn't help you, your doctor can take the device out. A small device placed inside your chest sends electrical pulses to your brain. The pulses block nerve signals that cause Parkinson's symptoms. After the system is in place and turned on, a DBS expert will adjust it so you get the best relief for your symptoms. You can also control the system yourself. You can turn it off and on, check the battery, and tweak the settings. Find a center with doctors who are trained and skilled in the procedure. Talk to all of the people who will be involved in your care, and to other people who have DBS. Discuss it with your doctor, and set realistic expectations for the outcome. DBS is costly, so be sure you know what your insurance plan covers. Get any approvals or paperwork you need. Ask a family member, friend, or caregiver to go through the process with you for support. You'll need tests to check your memory, thinking, and mood. Others, like MRI and CT scans, help pinpoint the part of your brain to be targeted. Since you'll likely be awake during the brain procedure, it may be easier if you have ways to stay relaxed. Look into practices like deep breathing and meditation. You'll have two procedures: one to place the lead in your brain, and one to put the pulse generator in your chest. Sometimes they're done at the same time, but often the lead goes in first. Then, you'll get the pulse generator a few weeks later. During the brain procedure, your surgeon will need a way to help him precisely navigate in your brain. This is often a wire frame that's screwed into your skull after your scalp has been numbed. Some surgeons use a frameless system with plates instead, screwed in the day before surgery. You'll have a brain scan, with the frame or plates in place, to create a "map." Your surgeon then makes a dime-sized hole in your skull. He'll use a special probe that attaches to the frame or plates to search for just the right spot to place the lead. You may need to answer questions or to move specific body parts, too. It's a very delicate process and may take a while, which is why learning calming techniques before the operation is good. When the target spot is found, your surgeon puts the lead in place. The wire that connects the lead to the battery pack runs under the skin of your scalp. The hole in your skull gets closed up with a plastic cap and stitches. You'll likely stay in the hospital overnight and go home the next day. The procedure to put the pulse generator in your chest takes less than an hour, and you'll have to be put to sleep for it. You'll need to keep taking your usual dose of Parkinson's medicine after surgery. Your device can't be programmed until the swelling in your brain goes down, which takes about 2 to 4 weeks, and you have the pulse generator. It also takes time to get the programming right. People need around six sessions over 6 months to find the settings that work best. But once you do, your symptoms could get better, and you may need less medicine. You might have problems with the DBS device, like a loose wire or lead in the wrong place. 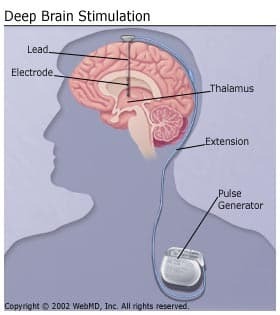 National Institute of Neurological Disorders and Stroke: "Deep Brain Stimulation for Parkinson's Disease Fact Sheet." Okun, M. Deep Brain Stimulation: Practical Guide for Patients and Families, National Parkinson's Foundation, 2017. Parkinson's Disease Foundation: "Surgical Treatments."